September 6th was the Hokkaido earthquake, and there has been great suffering to the people of Hokkaido who are in our thoughts and prayers. There was no big damage to the Kindergarten as well as the children or staff. Thank you for all the concern that you have shown us. The staff of this Kindergarten are very grateful. Some children were affected very deeply by this tragedy, not only losing their appetites, but also crying at night and crying just thinking about earthquakes. Children are always watching the actions of adults and need their support at this time. Tomorrow is the long-awaited Physical Festival. 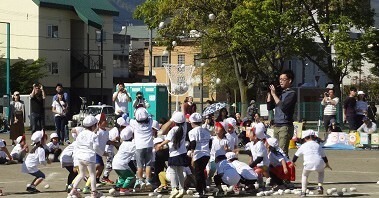 The Physical Festival allows children enjoy moving their bodies as well as co-operating with their friends. The children usually use mats, jump ropes and iron bars to exercise, however Physical Festival is a chance for children to express themselves through moving in unison, making shapes, not giving up while running and combining their powers together. For example, running a race is not just for winning but how to line up, and when to start running are important rules. Juniors can learn about these rules and have a lot of fun running. Intermediates fall down but never give up while running these races with their friends. Seniors can run to their full potential and aim to be number one. Of course, there are some children who are not good at running or keeping rhythm while dancing. However, it is important to not be content with not being able to do something but rather aim to improve. There has been great improvements from all the children over the past month and we hope you will enjoy seeing these improvements in the physical festival.